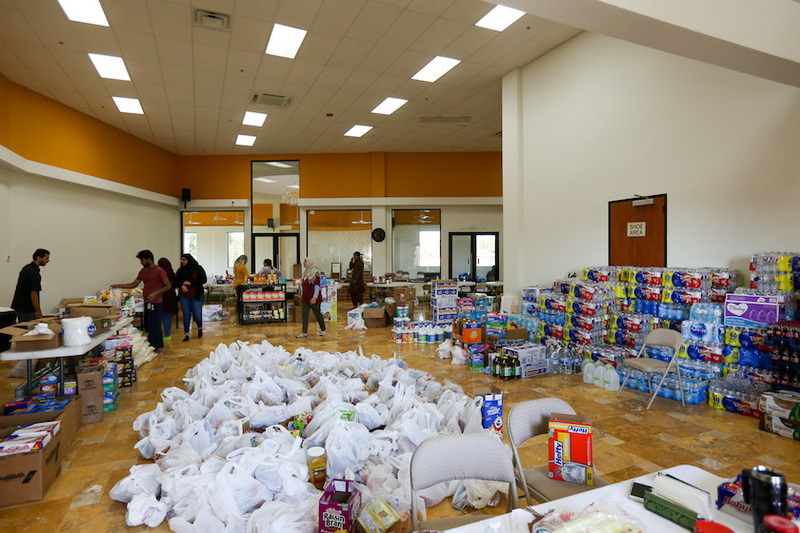 The young women’s laughter echoes around the foyer of their Beaumont, Texas mosque as they unpack bag after bag of donated food for those affected by Hurricane Harvey. As they chit-chat, they diligently sort donations by type to make it easier for families to find what they need. Only occasionally do they stop to pass around a phone when one of them receives a text (or maybe it’s a snap? I’m too old to know) that needs to be discussed with the group. They’ve got their organizational system down to a science: water and beverages on one side, then cleaning supplies, baby stuff, canned goods, bread and grains, microwavable meals, disposable flatware and finally, candy and chocolates. In the middle are dozens of grocery bags filled with miscellaneous snacks, cereals, and grab-and-go items. When the storm hit Beaumont, about an hour and a half outside of Houston, it knocked out the water supply to the entire city. Three days later, the water was still off in some parts of town, which meant many businesses closed, even if they didn’t flood—including markets, grocery stores, even the local hospitals. More than 100,000 people were left largely without access to food, water, and medical treatment. So when the flood waters receded and the members of the Islamic Society of Triplex found their building unharmed, they sprang into action. Within a couple of days, they had set up the pantry in the foyer and organized a free medical clinic in their offices for anyone who needed care. And if families need help but can’t make it to the mosque, they load up and deliver supplies. These wonderful people are serving anyone who needs it—no questions asked. This might sound like a no-brainer at a time like this, but it’s sadly not. Often in the midst of crisis, there’s a tendency to focus only on the immediate area and those we know, regardless of whether or not our community is the hardest hit. But this doesn’t go far enough. As we respond to the flooding in Texas, we’re coming alongside local partners who have a bigger vision for who and how they can help. We’re finding it in Houston, Beaumont, and beyond. In churches, mosques, and other community organizations. For these friends, the first question is not, “Are you one of us?” but “How can we help?” They do not see “us versus them.” They see that we belong to each other. We were in Beaumont to meet with local faith leaders about their needs, and deliver emergency supplies to keep their relief efforts going. When I ask the girls at the mosque why they are there serving, they’re confused by the question. “What do you mean?” they ask. They genuinely didn’t understand why they needed a reason. It’s just what they do. Why wouldn’t they? The only semblance of an answer they came up with was that their congregation had been saving for and working on their new building for nearly 10 years and just finished it last year. Now they have the space to serve their entire community, so they are. And they’re thrilled to do it. In fact, Tahir, one of the leaders at the mosque, hopes they’ll do more of it. He jokes that he’s been trying to get the mosque to simplify their name so people are more likely to think of them as a resource. We all laugh, but the fact that we’re standing in the middle of his community’s heroic response to the crisis and he still manages to be self-deprecating is impressive. This mosque’s response is representative of most of what we’ve seen here in Texas from people of all backgrounds and faiths—humility, kindness, generosity, sacrifice, solidarity. It is the best of humanity in the midst of tragedy. Peace born out of chaos. You’ve been showing up in the midst of chaos and tragedy around the world for years. Whether in Iraq or Texas, conflict or crisis, you show up. With unconditional love, unbelievable generosity, and unstoppable determination. Thank you for coming to Texas with us to respond side-by-side with people who share your vision, regardless of whether or not they share all of your beliefs. This is peace. And this is preemptive love.